FOR any child who has cancer, their best bet is to complete treatment in order to be cured. 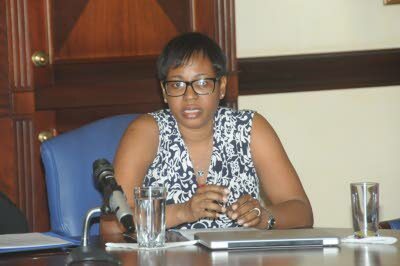 These were the words of Dr Michelle Reece-Mills, a paediatric oncologist at the University Hospital of the West Indies (UHWI) in Kingston, as she spoke candidly about some of the gaps in childhood cancer care locally at a recent Jamaica Observer Monday Exchange. Dr Reece Mills said several parents abandon treatment because of the costs associated with getting their children the care needed. The paediatric oncologist explained that, along with UHWI, there are three health institutions at which children with cancer are treated in Jamaica. The other two health facilities are Cornwall Regional Hospital and the Bustamante Hospital for Children. Cancer is the leading cause of non-traumatic deaths among children. Across the island, there have been between 50 and 60 children dying from cancer per year, the doctor stated. While, at the UHWI, doctors will see up to 15 children with different cancers — the most common type being leukemia, which is cancer of the body’s blood-forming tissues, including the bone marrow and the lymphatic system. “The University Hospital of the West Indies does not fall under the no-user fee policy of the Ministry of Health and therefore our parents often have the challenge of getting medication up front,” Dr Reece-Mills admitted. She went on to explain that the treatment time for leukemia is usually two to three years and that over time, a parent would have to provide about $2.5 million in order to complete treatment. Dr Reece-Mills, who is working to improve conditions for children across the island afflicted with cancer, is trying to raise money to offset the drug costs, because as she said, “without the drug we can’t really cure cancer”. And Sagicor has come to their rescue. Children with cancer across Jamaica, the Jamaica Cancer Society and the Black River Hospital Paediatric Ward have been identified as this year’s beneficiaries of the Sigma Run. Sagicor, organisers of the annual 5K which is scheduled for February 21 in Kingston, hopes to raise $50 million to contribute to the three causes. Of course, Dr Reece-Mills is grateful to Sagicor, who were also part of the Monday Exchange, for the opportunity to improve care for children with cancer. Sometimes too, there are delays in diagnosis, especially with respect to solid tumors. Dr Reece Mills explained that while patients await diagnosis, there is a risk of the cancer progressing. Dr Reece-Mills explained that they are also looking to raise funds for the insertion of central intravenous (IV) access to make the delivery of drugs a lot easier for these children. “As you can imagine, trying to give somebody an IV or an intravenous access weekly for two to three years, obviously… it is traumatic and you have no veins left after a while,” she said. So we are looking at the cost of that, which is usally around $40,000 per catheter insertion, but it makes their lives a lot easier, Dr Reece-Mills said, adding, “we want to improve their quality of life”. Because there are different modalities to administering treatment to children with cancer, access to drugs for treatment is only one of the problem areas. Dr Reece Mills explained that there is also surgery as well as radiation, which also come at a cost. “For the younger children we want to give more targeted radiation and again, in terms of access to that treatment, its usually around $1 to $2 million for about six weeks of treatment,” she said, underscoring how costly it is to treat cancer in children. Outside of costs associated with treament, Dr Reece-Mills shared that parents simply being able to afford transportation fees and the day-to-day costs are other problems when it comes to childhood cancer care. Some of the other childhood cancers that are seen locally include kidney, brain and bone tumors as well as rhabdomyosarcoma — the condition with which another guest at the Monday Exchange, Rusheka Goodhall, was diagnosed. Rusheka was diagnosed with stage three cancer at age three and had to have her leg amputated. Now at five years old, she has completed her treatment and is in the surveillance stage where doctors will monitor her. Rhabdomyosarcoma is a rare cancer of the muscle, in which a tumour attaches itself to the bone, either in the head, neck, urogenital track, arms, or legs. Rusheka’s mother, Shecker Anderson, is just one of the many parents who have had to endure in order to ensure her child had the best chance of being cured of cancer. And Dr Reece-Mills is trying to raise funds to offset several of the costs associated with treatment, so more children can have a better chance of being cured. “So (there are) a lot of concerns, but hopefully if we tackle them one at a time, we can be successful,” the paediatric oncologist said.